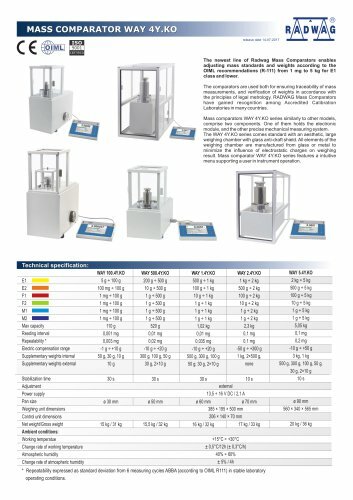 C€ The newest line of Radwag Mass Comparators enables adjusting mass standards and weights according to the OIML recommendations (R-111) from 1 mg to 5 kg for El class and lower. The comparators are used both for ensuring traceability of mass measurements, and verification of weights in accordance with the principles of legal metrology. RADWAG Mass Comparators have gained recognition among Accredited Calibration Laboratories in many countries. Mass comparators WAY4Y.KO series similarly to other models, comprise two components. One of them holds the electronic module, and the other precise mechanical measuring system. The WAY 4Y.KO series comes standard with an aesthetic, large weighing chamber with glass anti-draft shield. All elements of the weighing chamber are manufactured from glass or metal to minimize the influence of electrostatic charges on weighing result. Mass comparator WAY 4Y.KO series features a intuitive menu supporting a user in instrument operation. Technical specification: Power supply 13,5 + 16 V DC/ 2,1 A Adjustment external Change rate of working temperature ± 0,5°C/12h (± 0,3°C/h) Change rate of atmospheric humidity ± 5% / 4h Repeatability expressed as standard deviation from 6 measuring cycles ABBA (according to OIMLR111) in stable laboratory operating conditions.